Hello listeners! We’re excited to bring you a new style of episode today. We had a lot of fun breaking down what was good or not in co-op games, so we decided to expand on that format! 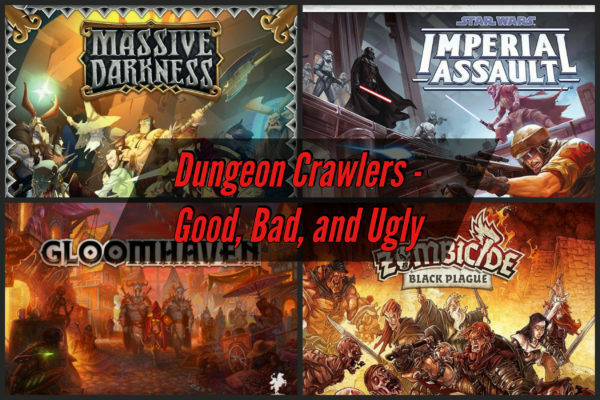 On the first ever Good, Bad, and Ugly, we tackle Dungeon Crawlers. Games like Zombicide, Gloomhaven, and others where you control individual characters moving around a map are frequently refered to as “dungeon crawlers.” But what about these games do people find compelling? What makes them frustrating? Join us and find out on today’s episode! As usual, we also talk about what we’ve been playing. This week, wwe talk about our recent SeaFall and Gloomhaven streams, plus a round of Mystic Vale.